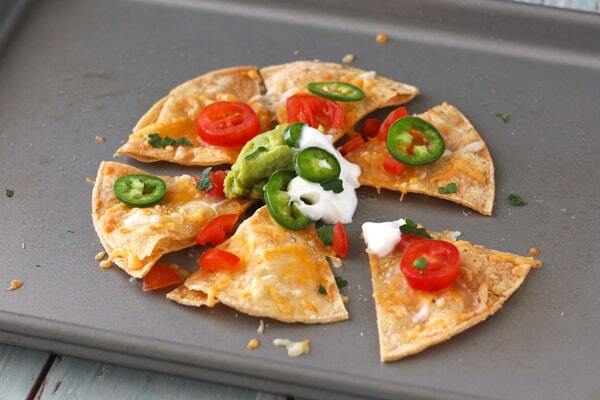 Nachos for one is the best way to satisfy your cheesy chip cravings without going overboard. 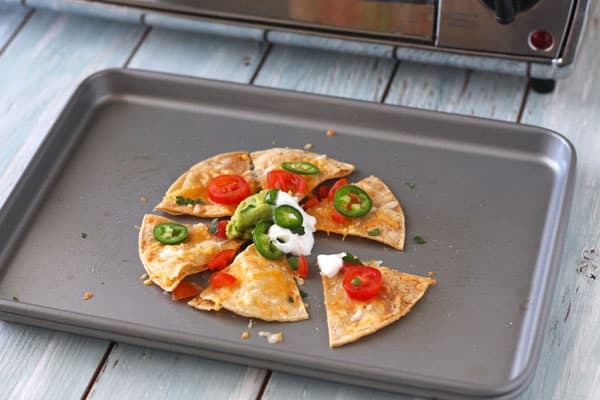 The crunchy toaster oven baked corn tortilla chips makes them extra delicious! I don’t know about you but I find the combination of melted cheese and corn tortilla chips IRRESISTIBLE. Like eat until you’re full and then keep eating because “it would be a sin to waste nachos” irresistible. Sometimes I’ll indulge my inner cheese lovin’ beast with a half batch of healthy-ish veggie nachos or sweet potato nachos. But on the days where only a real, basic, Chip n’ Cheese situation will do I throw together this nachos for one recipe. 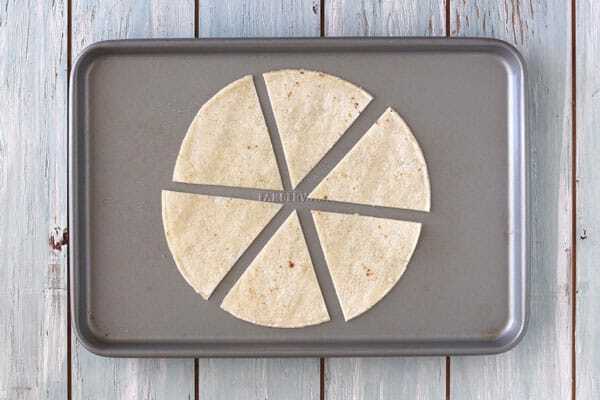 The whole thing takes about 20 minutes and thanks to our toaster oven the tortilla chips are crispy, not soggy like microwaved nachos. 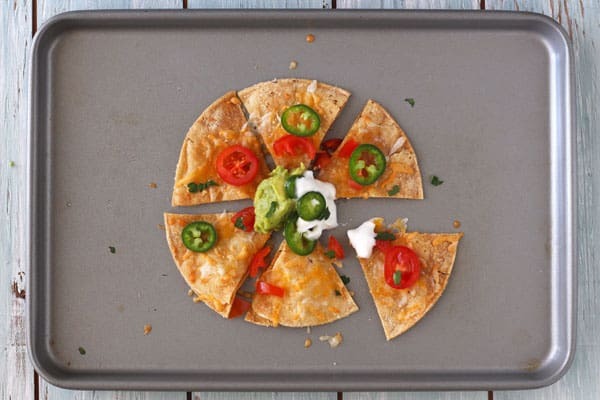 The secret to these tasty single serving nachos is baking your own corn tortilla chips. 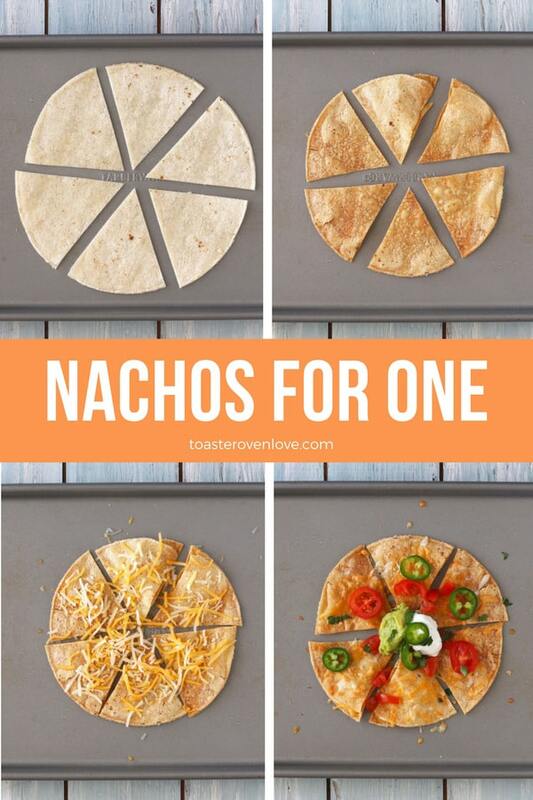 They’re portion controlled, super easy, and make the perfect base for a small batch of nachos for one. To make the chips you’ll need a corn tortilla, oil and, salt. 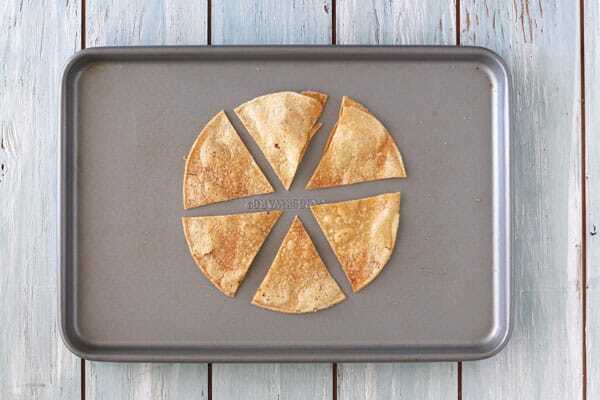 Spray both sides of the tortilla with a little oil, season well with salt and slice it into wedges. Bake the chips in a preheated 350F toaster oven for 8 minutes. Flip the chips over, and continue baking until crispy, about 3 to 4 minutes more. Let your chips cool on the pan for a few minutes, they’ll get crispier as they cool. Then pile on the cheese. Block cheese you shred yourself will melt best. But I usually grab a few tablespoons of pre-shredded cheese and get on with it. 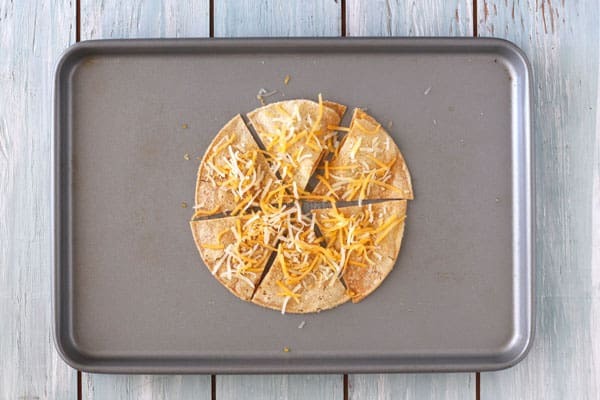 Top your chips with the cheese, turn your toaster oven to Broil and pop the pan back in. It should only take a minute or two for the cheese to melt so don’t wander off. Finish those cheesy chips with a few teaspoons of your favorite toppings. Then dig in before someone asks you to share! « Can you put foil in a toaster oven?